Why is dry skin prone to inflammation? When the skin is healthy it forms a barrier between the body and the external environment. This barrier is very effective at keeping water or moisture in the skin and keeping irritants out. If the skin barrier is damaged or there is a change in the structure of the skin that affects the barrier properties, moisture in the skin is lost and the outer layer of the skin becomes dry. Dry skin can become itchy and can let in irritants or allergens which can cause inflammation. Inflamed skin can also be a sign pointing to a number of medical skin conditions, including various types of eczema, and psoriasis. Where can I get help for my inflamed, dry skin? If you are worried about inflamed, dry skin you should contact your GP, nurse or local pharmacist who will be able to give you advice. An emollient is a medical moisturiser which can help to prevent excessive water loss from dry skin. Emollients contain oils which work by replacing lost natural oils in the skin and by helping to repair the skin barrier, forming a protective layer against irritants. Sometimes they also contain humectants which help to hold water in the skin. Some emollients may contain other ingredients with particular properties – e.g. 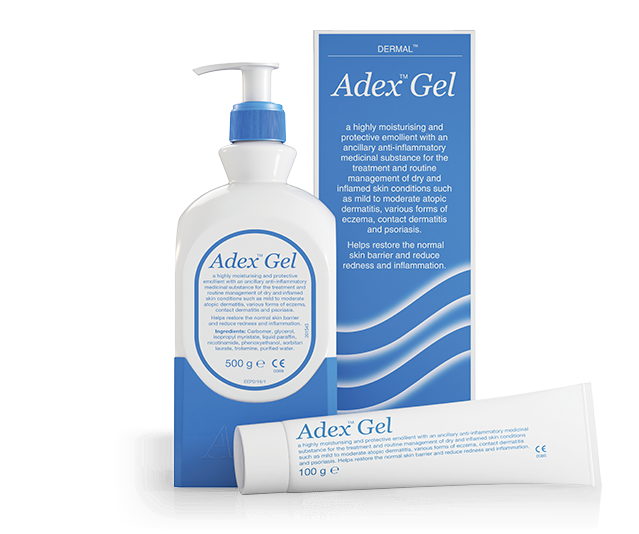 Adex Gel contains an added anti‑inflammatory medicinal substance, to help reduce inflammation and redness. Humectants are substances that attract water. Humectants help to hold water in the skin to reduce dryness. Some emollients contain added humectants, such as glycerol and urea, which are examples of naturally occurring humectants. What size pack is Adex Gel available in? Adex Gel is available in both 500g pump packs and 100g tubes. Can Adex Gel be purchased without a prescription? Although Adex Gel is available on prescription, it can also be purchased from a pharmacy - but you may need to ask for Adex Gel at the Pharmacy counter where prescriptions are dispensed. This website has been designed as an educational resource for patients who have been prescribed Adex Gel. Always read the label. Adverse events should be reported to Dermal. You are now leaving the AdexGel.com website. Do you wish to continue? Links to all outside websites are provided as a resource to our visitors. Dermal accepts no responsibility for the content of other websites.